2017, 2018, ACMCU, anti-Islamic, anti-islamism, EIR, EU, Europe, European Islamophobia, European Islamophobia Report, european union, Georgetown University, IACMCU, Islamophobia, Islamophobia in Europe, Islamophobic, OSCE, SETA, The Bridge Initiative, What is Islamophobia? 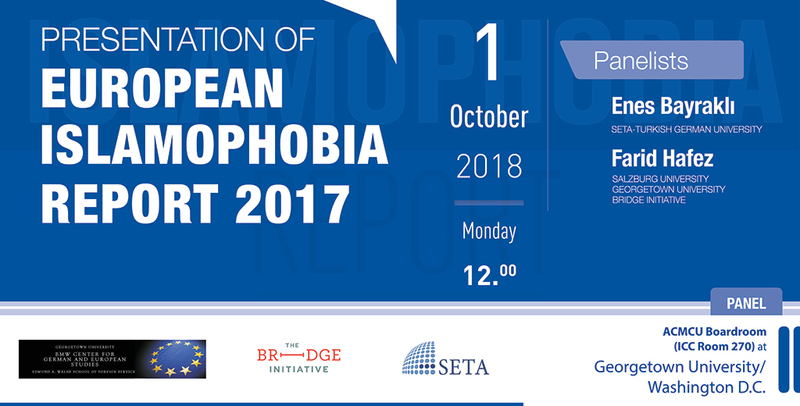 On October 1, 2018, the Foundation for Political, Economic and Social Research (SETA), a non-profit think tank based in Ankara, Turkey, will organize an event in cooperation with the Bridge Initiative at Georgetown University regarding the presentation of the European Islamophobia Report 2017 in Washington, D.C. During this event, the findings of the past year’s report and the events related to Islamophobia that have occurred in the recent past in European countries will be put on the table and discussed in detail. Co-edited by Enes Bayraklı and Farid Hafez, the European Islamophobia Report (EIR) is an annual report, which has been published since 2015 by SETA Foundation. The EIR documents and analyzes trends in the spread of Islamophobia in various European nation states. Every year on the International Day for the Elimination of Racial Discrimination (March 21), the EIR is published online and in print, and disseminated among leading stakeholders, politicians, NGOs, and anti-racist organizations. The EIR is presented at several supranational institutions such as the OSCE ODIHR, the European Parliament, and other important international and national institutions. The third issue of the annual European Islamophobia Report (EIR) consists of an overall evaluation of Islamophobia in Europe in the year 2017, as well as 33 country reports which include almost all EU member states and additional countries such as Russia and Norway. The report represents the work of 40 prominent scholars and civil society activists from various European countries. Panelists at the event include Enes Bayraklı and Farid Hafez, co-editors of the European Islamophobia Reports. In light of current developments, the event will serve to draw attention to the rising level of Islamophobia in European countries.